Regular exercise benefits people of all age groups. However, the older we get, the more important it is to have a regular exercise program. According to the American College of Sports Medicine, the benefits of regular exercise are extensive, and have been shown to reduce mortality and the risk of developing other chronic disease. 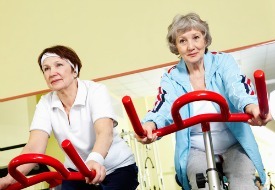 Because the aging population is the least physically active, it is important to encourage them to exercise. “The tips for getting people to exercise are not much different across the age groups,” says Keith Birkemeier, program director for Scott & White Healthcare’s Cardiac Rehabilitation program. Make exercise a priority and set time aside during the day. “Schedule it into your day, just like brushing your teeth,” says Mr. Birkemeier. Identify activities that they enjoy. Older adults are more likely to perform exercises they deem pleasurable. By selecting an activity that they like to do the chances are greater that they will continue doing it. Start slowly and advance the exercise program gradually. “I recommend starting off at two to three times per week, then move up to three to five times per week,” says Mr. Birkemeier. Set realistic expectations. “You never want to set an expectation you can’t meet,” he says. Be supportive. Older adults need to receive regular encouragement from friends and family. The challenges for the elderly population when it comes to exercising are knowing how much they should exercise, what’s safe and what’s not safe, and how intensely they should work out. This occurs especially if the person has a pre-existing condition, such as a heart attack or heart disease, because they tend to have less confidence in their ability to exercise. In addition, the older population may be on more medications –some which may interfere with balance– so it is best that they speak with their physician before beginning a workout program. “When it comes to exercising it is important to remember that there is no finish line; this is exercise for life,” says Mr. Birkemeier. Exercise	Runner’s High: is it Real?